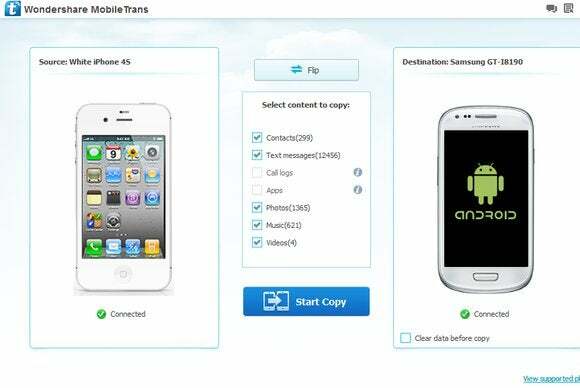 MobileTrans identifies your phones, and lets you know just how much content you have available to transfer. With MobileTrans, you simply install the utility, connect both your source phone and destination phone, and you're in business. Both phones must be connected at the same time, which means you can't use MobileTrans to back up the contents of your phone and transfer them at a later time—so if you're planning to exchange an old phone for a discount on a newer one, you're out of luck. But if you can keep both handsets for the transfer, you'll be pleased with just how easy MobileTrans is to use. The neat, clean interface makes it easy to see that your phones are connected, and the application walks you through any necessary steps you'll need to take—such as enabling USB Debugging mode on an Android phone—before the transfer can complete. MobileTrans keeps you updated on its progress as it transfers your data. 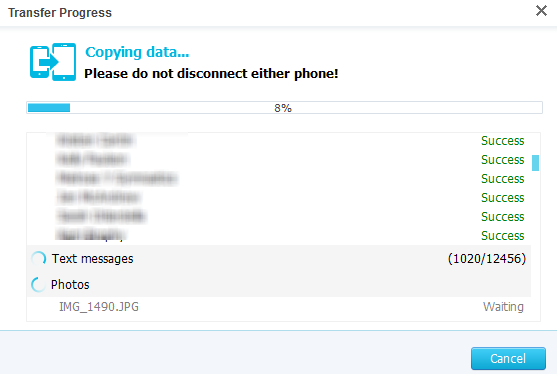 Wondershare has made a habit—and it's a good one—of releasing mobile phone utilities that are easy to use and make life just a bit easier. Its MobileGo application works well as a PC desktop tool for managing an Android device, and Dr. Fone recovers iPhone files you thought were gone for good. MobileTrans shares a family trait with these utilities: Until you use it, you never realized just how much you needed it.